It’s All About Getting Discovered..
SEO primarily revolves around placing keywords strategically throughout the site, link building, establishing site authority and using meta data that’s crawlable by Google. Search Engine Optimization is critical to attract and pull visitors to the websites. Here payment to search engines is not involved as with paid search ads or SEM. It is the process of positively affecting the visibility of a website, webpage or content in the search engines results. Unpaid results are also referred to as free, organic, natural, editorial or earned results. Search Engine Optimization is similar to Social Media Optimization with the objective being to grow the traffic flow to the website. The significant difference between SMO and SEO is that SMO is based on content and SEO is based on keywords. SEO can be divided into two distinct categories: On-Page (or On-Site) SEO and Off-Page SEO. Both are complementary to each other and go hand in hand in improving the search rankings of the website. However, we would advise getting the On Page right first before focusing too much on Off-Page SEO. 1: On-Page SEO is the practice of optimizing individual webpages in order to rank higher and earn more relevant traffic in search engines. On-page refers to both the content and HTML source code of a page that can be optimized, as opposed to off-page SEO which refers to links and other external signals. 2: Off-Page SEO refers to techniques that can be used to improve the position of a web site in the search engine results page (SERPs). In general, off Page SEO has to do with promotion methods, beyond website design for the purpose of ranking a website higher in the search results. On-Page Optimization undoubtedly is a pillar for SEO. Hence, On page optimization is a very important aspect of successful Search Engine Optimization. Whether it’s crawling of search engines or indexing the pages or may be improving the ranking of the results, on-page optimization plays a major role in SEO success. How To Improve On-Page SEO? Do away with duplicate content. Content writing is a very important feature to drive more traffic to our site. Regularly updating our content with fresh information, and appropriate keywords and phrases increases the ranking of our site. Adding keywords to our site is important but keyword stuffing can make your site unreadable. Alt tags are a way to accurately describe our images to search engines to make sure they’re indexed properly in image search, and therefore bring some extra traffic to our site. Broken images can cause the same issues as broken links by providing a poor user experience. One way to avoid this is to make sure we’re hosting images within our own media library, not on a third-party image host. Image optimization can make our site unique but it should be done according to certain criteria. The first one is the file size and loading speed of an individual image and the second is proper file naming and optimization. Search engine spiders can only read text and not images, so special tags are used to make them comprehensible to search engines. Title tags are used to tell search engines and visitors what any given page on your site is about in the most concise and accurate way possible. It is found that 35% of sites have duplicate title tags, 15% have too much text in the tag, 8% are missing them and 4% don’t provide enough text. The most important web optimization element is the title tag. The title tag should be a short but descriptive one, which will help the visitors learn more about us and our business. The title tag is indexed on the search engines, so the title tag has greater importance than other components. Our title should be good enough to attract users looking for specific information. The meta description is the short paragraph of text placed in the HTML of a webpage that describes its content. The meta description will then appear under your page’s URL in the search results. Research reveals that 30% of sites have duplicate meta descriptions and 25% of sites have no meta descriptions at all. Meta tag is a short description about our website, its focus areas and the services we provide. In the Meta tag it’s important that the title, keyword and descriptions written are distinct from other sites. The research showed that 35% of sites had broken internal links that returned bad HTTP status codes (70% of which return a 4xx page not found code). The research showed a warning of ‘low text-to-HTML ratio’ on 28% of sites analyzed. This means that these sites contain proportionally more back-end HTML code rather than text that people can actually read. It is recommend an acceptable lower limit beginning from 20%. Our page must always have some amount of plain text. Include easily readable – text with quality user information. It’s important to know the difference between H1 tags and title tags. The title tag appears in search results, whereas the H1 tag (normally our headline) is what visitors see on the page. 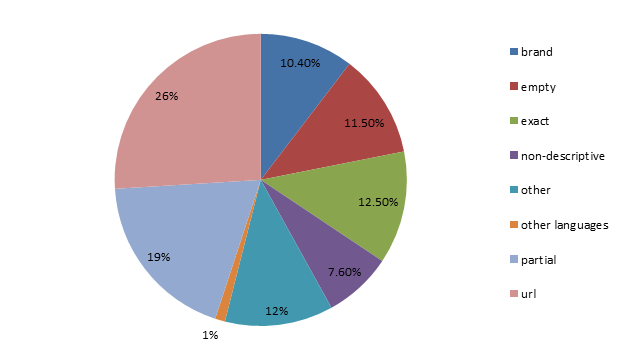 20% had multiple H1 tags, 20% were missing H1 tags, and 15% had duplicate information in their title tag and H1. We should ordinarily only use one H1 tag per web page and break up articles with plenty of h2 tags. Increasingly Google is ranking more in-depth articles over what it considers thin content. According to research, 18% have a low word count on some pages. The research reveals that 15% of sites have too many on-page links on some pages. Having a maximum number of links on a page isn’t a problem as such, but cramming a page with unnatural links definitely is. After all, a cluttered page full of links can be a bad user experience; especially on mobile. Proper link building improves your site’s quality. There should be effective external and internal links to secure high-ranking in search engines. 12% of websites have failed to include a language declaration stating the default language of the text in the page. Language declaration is useful for translation and page display, and ensures that people using text-to-speech converters hear your content read in the correct dialect of their native language. The research shows that 10% of websites analyzed contain temporary redirects. A 302 redirect can cause search engines to continue to index an outdated page while ignoring the page you are redirecting it to. A temporary 302 redirect won’t pass any link authority on to your preferred page, but a permanent 301 redirect will, so it’s best to avoid them. A canonical tag (“rel canonical”) is a way of telling search engines that a specific URL represents the master copy of a page. Using the canonical tag prevents problems caused by identical or duplicate content appearing on multiple URLs. Canonical tags let the search engines know which version of a page they should index. Specifying canonical tags is one of the most basic search engine optimisation tools. 13: 301 Redirect Or Canonical? We should always do a redirect, unless there are technical reasons not to. If we can’t redirect because that would harm the user experience or be otherwise problematic, then set a canonical URL. 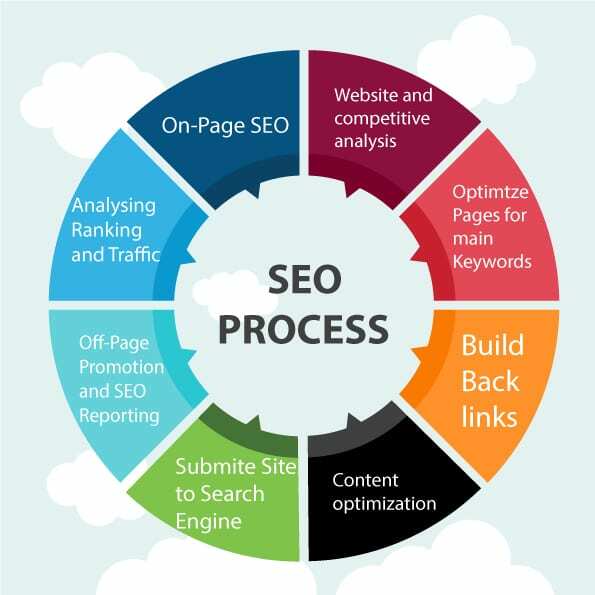 Off-Page SEO refers to all the things that we can do directly OFF our website to help rank higher, such as social networking, article submission, forum & blog marketing, etc. The idea of all these is to get links back to the site. So this is achieved through link building. And link building is nothing but Off-Page SEO. Google confirmed that links are the #1 ranking factor alongside with great content and said: “Ranking without links is really really hard.” The Google Core Algorithm is based on links, and that hasn’t changed since the inception of Google. A link is a connection from A to B. A hyperlink is a connection from the referring page to the target page. Link building is the process of getting other websites to link back to our website. In the field of search engine optimization, link building describes actions aimed at increasing the number and quality of inbound links to a webpage with the goal of increasing the search engine rankings of that page or website. Building links is one of the many tactics used in SEO because links are a signal to Google that our site is a quality resource worthy of citation. When we refer to a backlink we mean a reference from another web page to our own web page. This is very different from the ‘outbound’ or outgoing links from our page. A back link is also called an inbound link (IBL) and these links are very important in determining the popularity or importance of our web site for search engines like Google, Yahoo, Bing, etc. Editorial links are the links not acquired from paying money, asking, trading or exchanging. These links are attracted because of the good content and marketing strategies of a website. These are the links that the website owner does not need to ask for as they are naturally given by other website owners. Resource links are a category of links usually referenced as ‘Resources’ or ‘Information’ in navbars. Basically, they are hyperlinks to a website or a specific web page containing content believed to be beneficial, useful and relevant to visitors of the site establishing the link. These are the links acquired by the website owner through payment or distribution. Such links include link advertisements, paid linking, article distribution, directory links and comments on forums, blogs and other interactive forms of social media. A reciprocal link is a mutual link between two between two websites, to ensure mutual traffic. Website owners often submit their sites to reciprocal link exchange directories in order to achieve higher rankings in the search engines. Reciprocal linking between websites is no longer an important part of the search engine optimization process. Google has stopped giving credit to reciprocal links as it does not indicate genuine link popularity. Forum signature linking is a technique used to build backlinks to a website. This is the process of using forum communities that allow outbound hyperlinks in a member’s signature. This can be a fast method to build up inbound links to a website’s SEO value. Leaving a comment on a blog can result in a relevant do-follow link to the website. Most of the time, however, leaving a comment on a blog turns into a no-follow link, which are not counted by search engines. Website directories are lists of links to websites which are sorted into categories. Website owners can submit their site to many of these directories. Some directories accept payment for listing in their directory while others are free. Social bookmarking is a way of saving and categorizing web pages in a public location on the web. Because bookmarks have anchor text and are shared and stored publicly, they are scanned by search engine crawlers and have search engine optimization value. Image linking is a way of submitting images, such as infographics, to image directories and linking them back to a specific URL. Search engines will eventually find our site online, but that can take a while. To speed everything up, we should submit our website to the most popular search engines like Google, Yahoo, Bing, etc. We need to find out how to expand our audience or how to find a new audience and where they are right now so that we can effectively reach them. We need to think about our friends, relatives, colleagues, partners, clients who have a blog or a site. All we have to do is ask for a backlink. Ask for in-content links instead of links in the sidebar or footer. We need to be careful that the backlink comes from a website that is relevant to our niche. Use Social Networking Sites Like Facebook, Twitter, LinkedIn, etc. Today social media is huge, so tap it to the fullest! We can actively participate in answering questions on sites like Yahoo Answers. By answering and asking relevant questions on our site niche, we help to build up our reputation as someone that is an expert in our chosen field. We can place a link to our website in the source section if necessary so that people can easily find our site. Post comments on other blogs within the same niche, which allows us to add a link in the comments section. These links can then be crawled by search engines, helping to point them towards our site. These blogs are commonly referred to as ‘Do-Follow‘ blogs. Find forums online that are related to the sites niche and get involved within that community. We need to reply to threads, answer peoples questions, offer advice, etc. This all helps to build up our reputation as someone who is an expert within that niche. Try to use ‘Do-Follow‘ forums so that we can include a link to our site within your signature, which helps search engines crawl our site. For good link building we need to build good relationships. We should start with niche-related communities: forums, blogs or social groups such as the Link Building Experts Group on Facebook. We need to take the first step and start contributing with interesting and relevant comments and posts, providing contextual value to each discussion. By actively participating in these online communities focused on our niche, we will gain some good backlinks. Testimonial link building is a win-win scenario. Many businesses offer a chance to say a few words about our experience of using their products. On the one hand, this is a perfect way for them to build customer trust. On the other hand, it’s a great opportunity for us to get a backlink and potential traffic from that site and it usually has a much higher approval rate than our standard link request e-mails. A directory that not only gives us the chance to post a link to our website, but also provides useful information for our potential customers is a directory we want to be listed on. Niche directories and directories attached to informative websites for a specific industry are a good choice. Having our business listed with such directories makes it easier to get indexed in the major search engines and helps people find us online. Effectively choose the general and niche directories and efficiently choose the category for submission. There are many sites and blogs that will accept to publish our article. Before we write an article somewhere, make sure that: the website or blog is relevant to our topic; have a focus on quality i.e. it should be well written, professional, and interesting; keep in mind that a poor article can bring bad reputation. It’s important that we build links that help our website and not links that can negatively impact our website’s ranking in search results. Popular article directory sites like; Ezine, Go Articles, Now Public, etc. help drive traffic to our site. We don’t need a blog with one post and one backlink to our site. If we want to have our own blog, we need to keep it alive. We need to write posts on a regular basis. We need to focus on our industry and on our client’s needs! In time, it will most likely gain authority and backlinks. By writing a blog for our website, we give a reason for visitors to keep returning to our site and keep up to date with our latest posts. It also helps search engines to crawl our site more frequently, as they have to update our latest blog post entries, which ultimately helps us rank higher in search engine results pages (SERPs). We can write reviews about others businesses or ask friends/clients to write a review of our business in major business review sites like RateitAll, Shvoong, Kaboodle, Stylefeeder, etc. Depending on our site’s niche, we might find that listing in local directories may be useful. This will help us to reach a targeted audience. We should submit our website to sites like; Google Local, Maps, Yahoo Local, Yellow Pages, etc. Share the photos on the major photo sharing websites like Flickr, Picasa, Photo Bucket, etc. Other people will be able to see them and comment on them, hopefully following a link to our site. We can submit our videos to sites like; YouTube, Vimeo, etc. allowing people to find our content. Submit the latest blog posts and pages to the most popular bookmarking sites, like StumbleUpon, Digg, Delicious, Reddit, etc. Search engines really like these types of sites because the content on these sites is updated very frequently. We must properly handle the tags which are very essential to broadcast our news on a wide area network. This may increase our website traffic based on how effectively we have participated. If we run an e-commerce website, then a good strategy for advertising and branding our products for free is to submit then to online shopping networks. By submitting our products to sites like; Google Product Search, Yahoo Online Shopping, MSN Online Shopping, and other major social shopping network sites like Kaboodle, Style Feeder, etc. then we increase the likelihood of people finding the products that we are selling. Sometimes we find broken links to our website. This may be the case if the location of our page changes or if another webmaster misspelled our link. In both cases, these backlinks will return a 404 error. Such issues may also commonly occur after a site was re-launched or migrated to another domain. We should then redirect these backlinks to some other page. If we research our competitors, we will probably notice that they have some backlinks in common which we don’t have yet. Well, if they managed to get these backlinks, then we should too. What we have to do is analyze these backlinks and try to get them as well. We need to ensure that our content is relevant, useful and well-structured. This is the only way to ensure that the world will want to link to it again and again. That’s how we get great backlinks; we earn them!Great content is: desirable, findable, useful, accessible, credible and valuable. Good content will bring you a lot of natural backlinks!Google also checks technical features of the site like site load speed, navigation, design, keyword density, complexity, etc. Also, they will measure user experience through Click-through Rate (CTR), bounce rate or time spent on the site. Reciprocal Linking Excessive link exchange i.e. The strategy of ‘You link to me and I’ll link to you’. Partnering pages exclusively for the purpose of cross-linking negatively impacts website’s ranking in search results. Link exchange is good if we don’t do excessive reciprocal linking and these reciprocal links are on topic and make sense from users standpoint. Article Marketing or Guest Posting Links with over optimized anchor text in articles or press releases distributed on other sites. It’s great that people write about the website and link back to the website, but just as long as this creates links naturally. Stuffing the anchor text with commercial keywords is far from natural. Use brand keywords or navigational phrases instead. Web Directory Links Adding the site to any web directory just to get a backlink will have a negative effect on the website’s ranking. There are some directories that provide no real value to internet users and Google has also excluded them from its search results. The best directories are the ones that also provide useful information for potential customers. The key to link building is RELEVANCY. Therefore building links in niche directories and directories attached to informative websites relevant to the concerned industry are beneficial. Forum and Blogposts Comments Unhelpful forum or blog comments with optimized links in the post or signature. Participating in an active discussion on a forum or blog that is relevant to the concerned business. Further, if the comment provides contextual value to the discussion, then sharing a relevant link helps. Don’t Buy Links Google clearly states that buying backlinks to improve rankings breaches their guidelines.They consider links as votes and paying for a vote is unethical. Links bought from sites that openly state on their site that they sell links will lead to Google Penalty! W must invest in creating high quality content and promoting the site in a way that attracts natural backlinks. We can achieve better results through this with patience. If we want a risk-free approach to SEO then remove all bought links. A No Follow tag is a way that allows webmasters to tell search engines “Don’t follow links on this page” or “Don’t follow this specific link.” A link can have one or more rel attributes, where “rel” is short for “relationship”. These attributes help define the relationship a link has with a page that it points to. Anchor text is the visible, clickable text of a link. It usually appears in a different color(often in blue) than the surrounding text and is often underlined. Good anchor text tells the reader what to expect if they click on the link. It is possible to change the color and underlining through html code. SEO could mean text search or even image and video search. Video SEO is abbreviated as vSEO. The term video SEO is used to describe optimizing video content for search engine traffic. The goal when working with video SEO is to have the video content appear in video search engines as well as in the organic search results for major search engines with traffic being directed to the site. SEO PR is a combination of writing press releases and other marketing papers for search engine optimization purposes to generate leads as well as traffic to a website. SEO PR is also called Internet Public Relations. PageRank (PR) is an algorithm used by Google and other search engines to rank web pages in their search engine results. PageRank is a way of measuring the importance of website pages. According to Google: PageRank works by counting the number and quality of links to a page to determine a rough estimate of how important the website is. According to Google, every additional second of landing page load time represents a 20% dip in conversion rate. This is no good. We need faster landing pages and we need them yesterday. We should strictly avoid SEO Spam and Black Hat SEO. SEO Spam refers to SEO manipulation techniques that are used to increase search engine ranking, but violate the search engine’s Terms of Service. Black Hat SEO refers to the use of aggressive SEO strategies, techniques and tactics that focus only on search engines and not on the human audience and does not obey search engines guidelines. Examples of black hat SEO techniques include keyword stuffing, invisible text, doorway pages, adding unrelated keywords to the page content or page swapping (changing the web page entirely after it has been ranked by search engines). Black hat SEO is more frequently used by those who are looking for a quick financial return on their website, rather than a long-term investment on their website. Black hat SEO can possibly result in the website being banned from search engines, however since the focus is usually on quick high return business models, most experts who use Black Hat SEO tactics consider being banned from search engines an irrelevant risk. White Hat SEO refers to the usage of optimization strategies, techniques and tactics that focus on a human audience opposed to search engines and completely follows search engine rules and policies. White Hat SEO is also called Ethical SEO. A website that is optimized for search engines, yet focuses on relevancy and organic ranking is considered to be optimized using White Hat SEO practices. Examples of White Hat SEO techniques include using keywords and keyword analysis, backlinking, link building to improve link popularity and writing content for human readers. Local SEO is when certain businesses optimize their online presence to rank for locally specific searches. Local SEO normally stops at cities, districts, or regions. Hyperlocal SEO is doing the same kind of optimization, but for smaller, more focused localities such as neighborhoods, towns, streets, and spots located near well-known landmarks. As increasing numbers of web searchers use mobile devices to look for businesses. And as people are increasingly searching for businesses ‘near me’ or ‘near to…’ and are more often using hyperlocal locations in their phrases and search engines are therefore responding to these mobile habits of users. Therefore On-site content should reflect hyperlocal terms. We should analyze the success of our hyperlocal search terms using Google My Business, Google Analytics etc. and tweak them if necessary. We should set up our Google My Business profile. The service is free to use. By signing up to Google My Business we can tell Google directly the name of our business, the exact location, what it does, opening times, what it looks like i.e. upload our own images and many more attributes. It is of particular relevance to the map results and the 3-pack listings that appear for mobile searches. For instance, Google smartly tells the searcher whether the business is open or closed right now and pulls out images to give users more of an idea of what to expect. 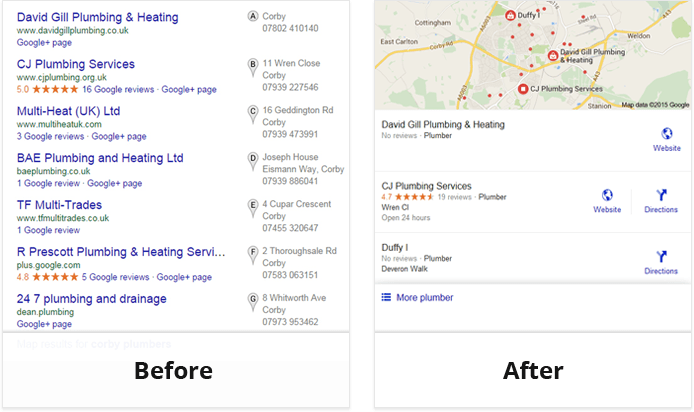 Google My Business also allows us to post updates to give customers an idea of current offers and events direct from the search results. We can also make use of the insights and analytics to get an idea of how well our hyperlocal visibility is working. 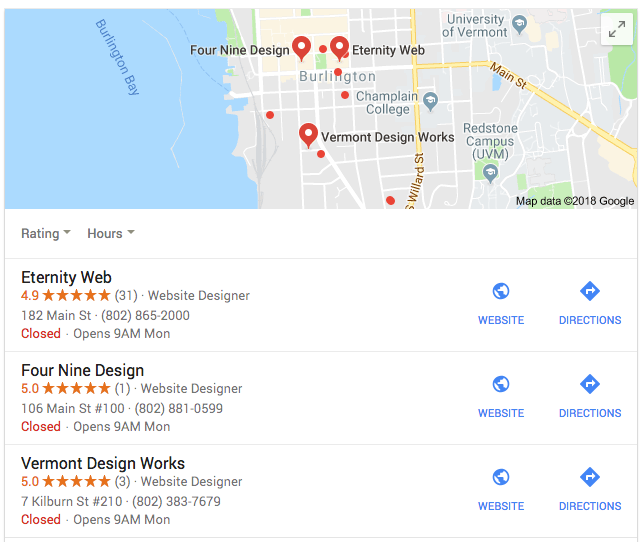 Google displays the local 3-Pack of Google Maps before organic results across all devices. For a local business, there is no better place where one would rather rank. Technical How well the technical elements of a site enable it to be accessed, crawled, and indexed by search engine bots. If a site isn’t properly indexed, it will not be ranked by search engines and no amount of on-page content or links will bring visitors to the site. Hence technical SEO is a key driver of organic traffic. Technical SEO is often an afterthought once a site has gone live, but most of the issues that get flagged in a technical SEO audit can be avoided if they are considered in the early stages of the web development process. Search-engine (and user-) friendly URLs: URLs are meaningful to users, don’t link to duplicate content, and use hyphens rather than underscores where possible. Content The quality of a site’s visitor-facing content with respect to how it engages users and how well the meta-content aligns with the site content. Accurate, descriptive meta-content sets visitor expectations, and together with high-quality site content, ensures visitors don’t bounce back to the search engine. Good visitor engagement levels, in turn, mean that a site’s content is relevant and will be ranked higher by Google. User content quality: Content is current, concise, easy to read, is free of misspellings, with few broken links. User Experience How effectively embedded information like links and visuals is used to enhance the user experience. A well-organized link hierarchy and properly defined images boost a site’s usability and indexability. User-friendly visuals: Images are retrievable, accessible and don’t slow down page loading time. Good visuals increase traffic from image searches. Mobile How responsive or adaptable a site is to being used and displayed on a mobile device. As mobiles increasingly become the primary device for accessing websites, having a mobile-ready site is critical for user retention and conversions. Responsiveness: Content is dynamic and optimized for the mobile operating system. SEO and Google are always evolving and we need to work in sync. In recent past, BPM has achieved some fantastic SEO results – such that some not so famous websites have ranked extremely high in search results for particular keywords vis-a-vis some well entrenched sites.